1. Apply Too Faced Shadow Insurance all over the eyelid to prime the eye. You can either use your fingers or a flat synthetic brush (e.g. MAC 242). 2. Sweep Texture into the crease using a windshield wiper motion (e.g. MAC 217). 3. Add Folie into the crease (e.g. MAC 217) to add extra dimension and shape to the eye. 4. Take a flat shader brush (e.g. MAC 239) and pat Green Room on to the outer lid. 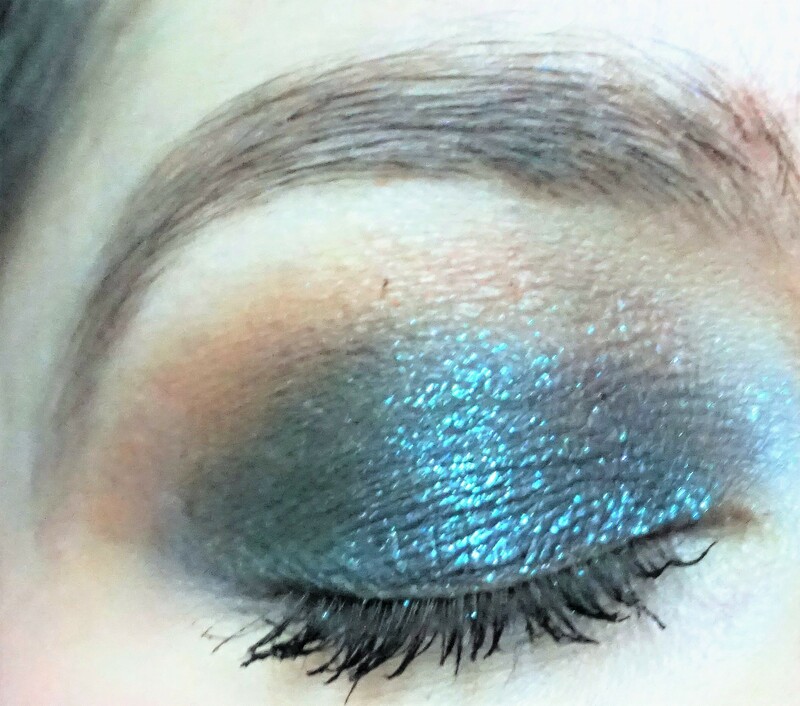 This step adds a little extra contrast to the other colours on the eye. 5. Take a flat shader brush (e.g. MAC 239) and load it with some Galaxy eyeshadow. Spritz the brush with Urban Decay All-Nighter Setting Spray and apply Galaxy to the lid. Repeat this stage (load the brush with eyeshadow, spritz with spray, pat on the lid) for the other eye. 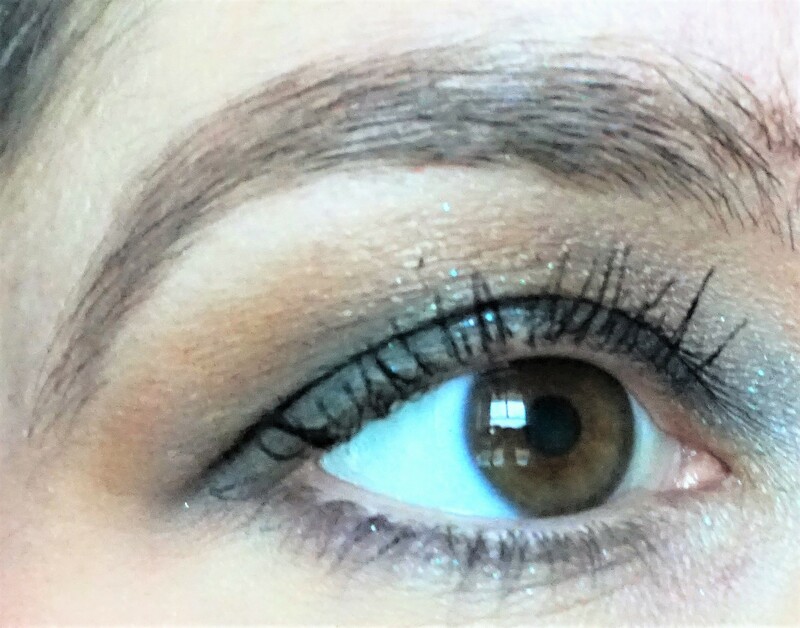 Applying the eyeshadow with a spritz of setting spray (or water, if you prefer this option) makes the eyeshadow look more intense and shimmery on the eye. It also further helps the glitter particles to adhere to the lid. Be careful not to get water on to the eyeshadow itself, as this may cause the product to harden. 6. Take a crease/blender brush (e.g. MAC 217) and apply Soft Brown to the inner crease of the eye. This step adds a little extra warmth and shape to the eye. 7. If necessary, you can touch up the colours you placed in the crease (steps 2 and 3) and outer lid (step 4) again. I also added in a little of Plumage eyeshadow to the outer crease of the eye to give the look some extra smokiness. 8. Using a crease/blender brush (e.g. MAC 217) or a pointed crease brush (e.g. MAC 226), sweep Brule on to the browbone to highlight and blend out the edges of the crease colour. Using a matte highlighter shade helps to ‘clean up’ and freshen the eye when using such bold shades on the lid. 9. Take the flat shader brush that you used in step 5 with some of the remaining Galaxy eyeshadow on it. Dip into a little of Typographic and lightly sweep along the lower lashline. 10. Using the same flat shader brush, very lightly sweep Typographic along the upper lashline. 11. Apply plenty of black mascara to the top and bottom lashes. Black mascara really helps to frame the eye when using such deep coloured eyeshadows.